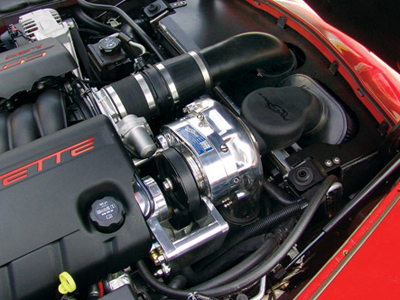 HO Intercooled ProCharger Tuner Kits and Complete Systems for the LS3 Corvette offer OEM appearance, fit and finish, and deliver industry leading performance and durability. This new LS3 offering produces a 40-45% hp gain with just 5-6 psi of intercooled boost. Higher boost and power levels are available for modified motors. The front facia design on the C6 Corvette allows for the use of a single, center-mounted, air-to-air intercooler system. When coupled with the high-flowing, durable and extremely efficient ProCharger, this air-to-air intercooler substantially improves overall performance and engine reliability. With a P-1SC-1 self-contained head unit and highly-efficient air-to-air intercooler system, the LS3 kit continues the legacy of ProCharger's industry leading LS1, LS2, LS6 and LS7 supercharger systems.